Norwegian Royal Viking Line, with the installation of a new type of electrolytic anti-fouling and corrosion system. A brochure is available describing the proc- ess and recent applications. Viking Sea," a 21,000-grt vessel operating between San Francisco and Alaska. Normal fouling prob- lems created by the growth of bio-fouling in pipework, con- densers, and sea water service equipment, were rapidly accele- rated by the excessive changes in temperature from cold Alas- kan to the temperate waters of the U.S. Pacific Coast. SATCOM Terminal " from Raytheon. captains of industry with captains at sea. High-speed, down- to-earth satellite communications. Model JUE-15A MK II is supplied in two versions: Telephone hand-set with teleprinter. Or telephone handset, video display panel with keyboard and printer. A MK III model is also available. It provides basic services at low cost, with telephone hand- set only. JRC and brought to you by Raytheon, has been thoroughly tested for accurate operation and reliability. Units are now in use on ships of all kinds. Japan provide support for over 200 worldwide service agents located in major ports everywhere. We constantly monitor field service data to improve product reliability and to ensure that the correct parts and quality service are immediately available when and where needed. Technical and Operational training programs will be provided upon request. JUE-15A MK II to get your message across. Company, its divisions and affili- ated companies. His new duties will include general facility en- gineering, energy management, plus both marine and industrial product development. 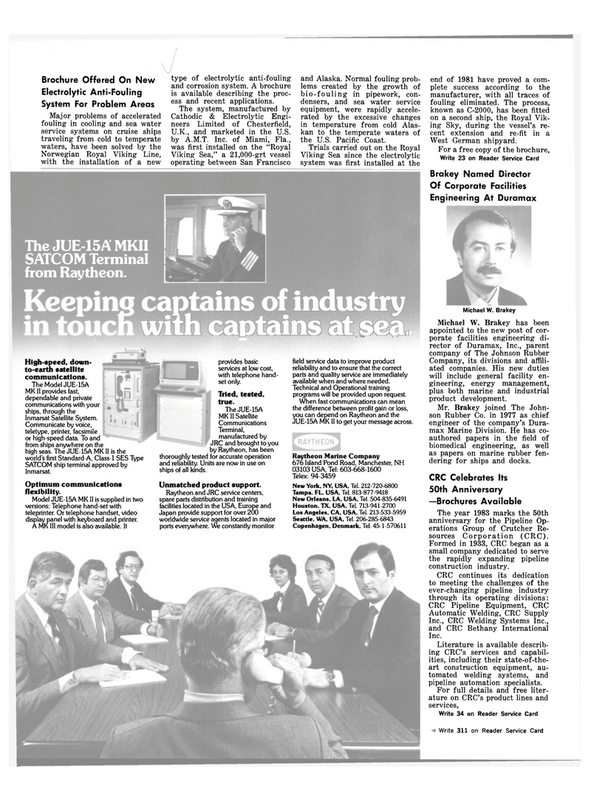 Mr. Brakey joined The John- son Rubber Co. in 1977 as chief engineer of the company's Dura- max Marine Division. He has co- authored papers in the field of biomedical engineering, as well as papers on marine rubber fen- dering for ships and docks. The year 1983 marks the 50th anniversary for the Pipeline Op- erations Group of Crutcher Re- sources Corporation (CRC). Formed in 1933, CRC began as a small company dedicated to serve the rapidly expanding pipeline construction industry. Literature is available describ- ing CRC's services and capabil- ities, including their state-of-the- art construction equipment, au- tomated welding systems, and pipeline automation specialists.